Matthias Duck, son of Cain, a baker, and Elizabeth, was born in Blackland, Wiltshire, in about 1820. In 1841 he was staying with his uncle, Abel Duck, in Pickwick, Corsham. Both Abel and Matthias were shown as carpenters. On 27 November 1844, ay the age of 24, Matthias joined Wiltshire constabulary. Ann Adams, daughter of Thomas and Elizabeth, was baptised in Chisledon, Wiltshire, on 11 April 1830. Matthias was promoted to sergeant on 13 February 1850 and the 1851 census shows the family living ‘in Coxtalls’ in Wootton Bassett. However, he resigned on 24 March 1858 and the 1861 census shows him as a baker and innkeeper at the ‘Castle and Ball’, in Wootton Bassett High Street with their first four children. 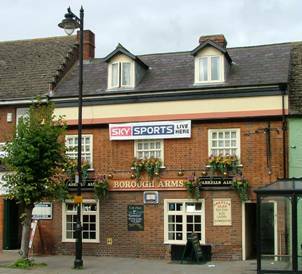 The Castle and Ball has since reverted to it’s original name of the Borough Arms. He re-enlisted on 26th June 1864, giving his age as 39yr 6mths, when in fact he was 43/44. The upper age limit of the constabulary was 40. His service record shows that he had a dark/florid complexion, dark eyes and was 5'9"/5'10" tall. In 1871 he was again shown as a police sergeant, this time living in Ramsbury High Street, along with all their children apart from Agnes, who was in service as a nurse, and Louisa, who was staying as housekeeper to two uncles and her grandmother, Elizabeth Duck, in Stockley. Matthias was dismissed from the police force on 13 March 1875 with no reason given. On Louisa’s marriage certificate in 1879 Matthias’ occupation was given as carpenter. Matthias’ death, aged 59, was registered in Bristol in the first quarter of 1881. At the 1881 census Ann was shown as a coffee house keeper livingin New Passage Road, Henbury, Gloucester, apparently between Darks Cottage and Salt House, with Elizabeth, Ruth and Edwin. In 1891 Ann was living at 6 Berwick Street, Bristol, with her son Edwin. She appears to have died before the 1901 census. Louisa married William Newns, a Methodist minister, in 1879. Agnes was a servant in Ramsbury in 1871 and in 1881 she was in Swindon with a 2-year-old son William, probably the son of Robert Williams, hairdresser, for whom she was working as a housekeeper. She must have died as by 1891 Robert had moved to Ramsgate, married and was bringing up William as his son William Williams. Albert Mathias Q4 1881 Pilning, Glos. Rosa A ca. 1883 Pilning, Glos. James Edwin Q1 1886 Pilning, Glos. Walter Ernest Q4 1887 Bristol, Glos. By 1891 Albert had become a passenger train guard for the Great Western Railway and they were living at 40 Winstanley Street, Bristol. By 1901 they had moved to 141 William Street in Swindon. Albert was still a guard and his son Albert was a locomotive fireman. Rosa was a board school pupil teacher and James was a railway clerk. In 1911 the family were still in Swindon living at 76 Rosebery Street. Albert died later that year, aged 56. By 1911 they had moved to 2 Sherwold Villas in Loose, near Maidstone, and Walter was working as a domestic gardener. Their married daughter, Louisa, and daughter-in-law Minnie, Albert’s wife were visiting them, both with children born in Ontaria, Canada. In 1911, Elizabeth was running Artes? Farm in Swindon Road, Wroughton, along with her three sons. Elizabeth died in 1922. Ruth had died by 1901. By 1911 they had moved to Chippenham and were living at 20 Park Lane and their son George was also working for GWR as a bookstall clerk.